We're still enjoying summer vacation here at ChiIL Mama. Chi, IL public schools don't start till the Tuesday after Labor Day, so we're squeezing fun adventures into every last minute of warm weather and school-free days before junior high and high school, homework and tests begin again. We wanted to do another family day at Raging Waves Water park, but I couldn't get my son & daughter's busy camp schedules and off days to mesh. Then we tried to throw friends in the mix and the schedule nightmare grew. Finally we decided the only way to make it work was to have a guys day and a girls day. This one's quick so enter early and often! 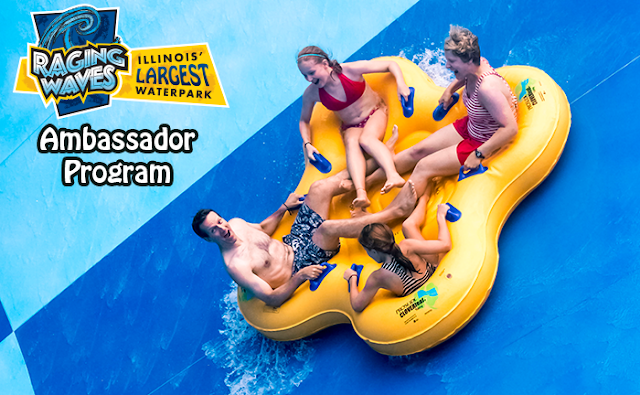 We're so excited to be back as a Raging Waves Waterpark Ambassador again for the 2nd summer that we're giving away 2 FAMILY 5 PACKS of TICKETS ($160 value each) so you can have one last big splash over Labor Day, Saturday-Monday before we say goodbye to Raging Waves for the season. Two of our lucky readers will WIN 5 Tickets each ($160 value/2016 season only) to Raging Waves. ENTER HERE through midnight Monday 8/29. 2 winners will be randomly chosen via Rafflecopter. The weather said scattered thundershowers last Friday, but Sage and two of her friends were available, as was a friend of mine and her 2 kids. All the local kids near Yorkville were back to school already, so lines were super short and the girls got some serious slide time in. We did have a crazy hard downpour in the morning when we first got there, but the park always opens unless there's lightning, high winds or dangerous conditions. We waited it out and it turned into an amazing sunny day. We had an awesome time at the waterpark with two 13 year old girls, two 12 year old girls, one 10 year old little brother and 2 moms. It was epic! The girls hit all the slides multiple times and had a blast together in the wave pool too. We got 3 waterproof UKCOCO cell phone cases off Amazon to review, so this was a great chance to put them to the test. 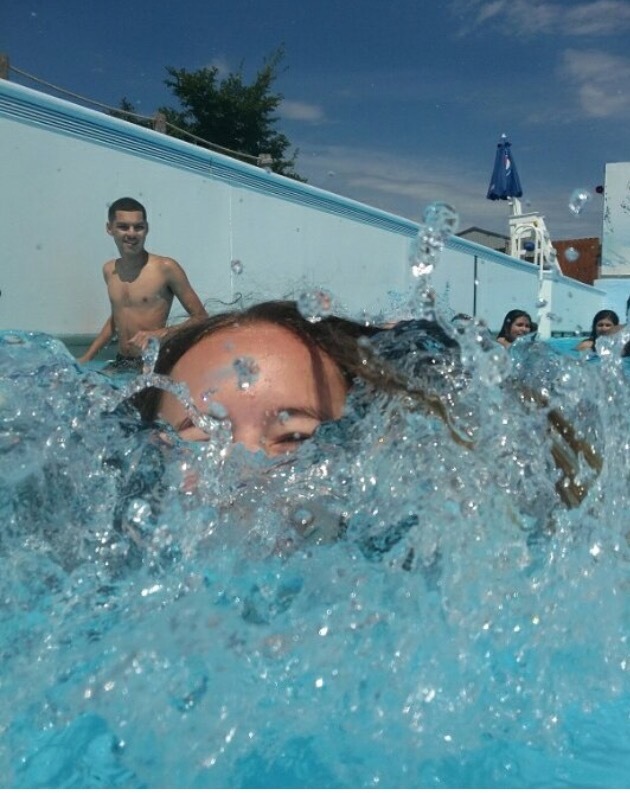 This was an underwater selfie by my daughter, Sage. The other shots of her in the water were taken by her friend, Vanessa. It was Vanessa & Gabby's first visits to Raging Waves. One of our favorite things to do is introduce friends to the park. They all enjoyed the slides immensely, including the NEW Wonambi. Of course the teens and tweens were all about the slides and wave pool. I've ridden almost every slide in the park, too. As an adult, though, I was happy this time to stick to the wave pool with my friend and ChiIL out with a Game of Thrones book. Winter is coming, ya know.... But it's NOT here yet!! Raging Waves has plenty of seating in the sun and shade. CLICK HERE AND SCROLL DOWN FOR MORE OF OUR RAGING WAVES PHOTO FEATURES: http://bit.ly/28QdGrr. We love that the beautiful landscaping makes Raging Waves seem spacious with lots of green space and shade. Even the littles can have big fun while they're waiting to "measure up" to the magic 48" needed for the big slides. Lockers start at $10 and come with 4 wristbands so more of your group can access cell phones, money & valuables without tracking mom down every time. Worth it for the peace of mind! One of our favorites for frozen treats! Although we generally eat at Raging Waves and snack there all day, it's still become a tradition to stop by a local bar/restaurant just down the road from the waterpark after a long day of sun and fun. I ate dinner there with the boys the time before this visit, as we waited for the worst of Chicago's rush hour to clear a bit. Since I had a carload of girls, we just stopped for their infamous floats, before our couple hours in the car to drop everyone home. Calamity Janes gives everyone jeans pockets for coasters. The girls saw an opportunity for a puppet show. The wild west flair from bison heads to vintage photos and great quotes make this a fun place to stop. Apologies to Calamity Janes for my lollipop lovin' girls. I didn't realize how much they were raiding the free lollipop bowl until I came back from the bathroom and they said you had to hide the candy stash from them. Sometimes 12 & 13yo girls can be a bit like toddlers. Hope the extra tip helps. You can get a float or regular draft root beer in a keepsake glass and bring it back for a discount on subsequent visits. We had 2 black cows (coke & ice cream) and 2 root beer floats in the group and they were delicious! ChiIL Mama has loved being a Raging Waves Waterpark Ambassadors again this summer. We chilled out with friends many times this season, and had awesome Aussie themed fun "down under" Chicago in Yorkville, IL. Thanks so much for all the endless summer memories. We'll see ya next year! Disclosure: Once again, we're happy to partner up with Raging Waves Waterpark and have been compensated for sharing this information with our readers. We were not compensated in any way by Calamity Janes (except an accidental over abundance of dumdums thanks to the tweens). As always, all opinions are our own.